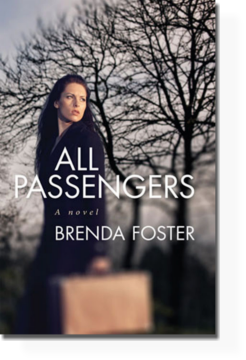 Listen to author Brenda Foster read an excerpt from All Passengers. Brenda Foster’s journey has taken her from a seaside town in the north of England — not unlike fictional Bogmire in All Passengers — to Canada, British Columbia, Australia and, finally, to the place where she had always wanted to go, San Francisco. 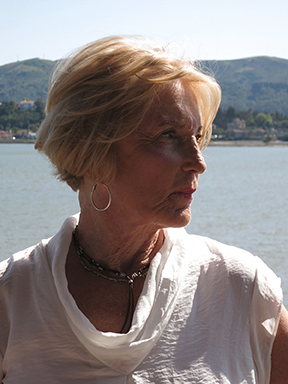 Settling first in Sausalito (her neighbors were members of a then up-and-coming band called the Grateful Dead), today she is at home in nearby Tiburon along the shores of San Francisco Bay. Trained as a nurse and midwife, it was her career that took Brenda away from England. One of five children in a household where money was tight, "Nursing gave me independence. It put my feet on the ground," says Brenda. Her father instilled a love of reading; her mother's hard work and struggles proved inspirational. But it wasn't until years later that the two melded with Brenda's talent for storytelling to become All Passengers, her first book. The mother of two daughters, she began her writing career in Australia, joining an established writer's group in Melbourne. "My first story was a children's story about a ball and posed the question, 'What kind of ball would you like to be?'" Humorous but with a gentle life lesson — "a ping-pong ball, because it doesn't usually get hit too hard" — the story was well received and Brenda gained the confidence she needed to continue her writing career. Before and during her late husband's illness, Brenda volunteered with a local group that supported the dying through the simplest, but often the most difficult, of interactions: just listening to what they had to say. "Listening is the unseen connection. Listening is loving. I learned about acceptance," she says of the experience. "I learned to appreciate life" — an appreciation of the human spirit that infuses All Passengers. Available in print from Barnes & Noble and Amazon. E-book available in Kindle, Nook and iBook formats.